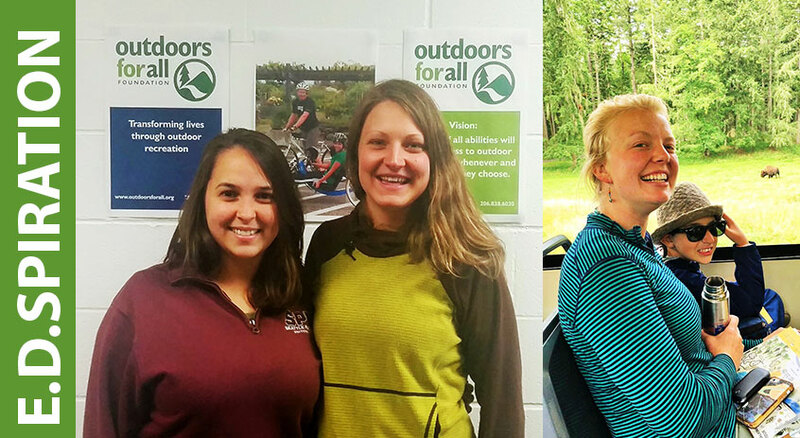 I’ve been fortunate to serve as executive director with Outdoors for All now for almost 22 years. I still regularly pinch myself at how fortunate I am! I get to work with some terrific people — and we get to work together to use outdoor recreation as a means to enrich the lives of thousands of children and adults with disabilities each year. Recently we’ve had some dedicated staff members head on to other chapters in their lives and I know that I and many others wish them the best. Jacqueline Reyes grew up in the Pacific Northwest and moved to Seattle for college. While studying Ecology at Seattle Pacific University, she developed a deep love and passion for the outdoors. She joined the Outdoors for All team back in 2010 as a work study and a summer day camp counselor. After graduating, Jacqueline spent three and a half years serving as a Peace Corps volunteer in rural Paraguay and extended her service to work for WWF Paraguay. Now back from the Paraguay, Jacqueline is excited to be back in the Northwest. Jacqueline enjoys climbing, hiking, kayaking, and anything outdoors. Kenna Chapman is a recent transplant from Steamboat Springs, Colorado. Kenna is excited to be living in the Seattle area and working with Outdoors for All. After growing up on a small farm in Indiana, Kenna decided to attend Colorado State University to be closer to the mountains. She received her B.S. in Exercise Science and Spanish. While in school, Kenna worked and volunteered with various programs for at-risk youth as well as youth with developmental disabilities. For the past four years Kenna worked at an adaptive recreation program in Steamboat Springs where she earned her PSIA Adaptive Level II and Child Specialist Alpine certifications. She also holds certifications in Adaptive Waterskiing. Kenna is passionate about making sure everyone has the ability to recreate and enjoy the fresh outdoor air. In her free time, Kenna is looking forward to exploring the new ski terrain near Seattle, hiking, kayaking, gardening, and eating all of the seafood she can handle! Emily Paulson loves to work and play outside, as a result of spending her childhood surfing, hiking, camping, and biking on the central coast of California. She began in adaptive recreation in high school, while volunteering as a surf instructor with Project Surf Camp. Emily returned to coach surfing for many summers while in university. She studied education and Spanish, and was an active member of her collegiate triathlon team. Following college, Emily worked as a Naturalist at an outdoor school in the Santa Cruz Mountains. She continued in outdoor education, working seasonally in California and Washington with camps, for an organic farm, trip leading, ski instructing, and as a Lead Day Camp Counselor with Outdoors for All. Emily holds a Bachelor’s of Science in Liberal Studies, with minors in Spanish and Latin American Studies, from Cal Poly State University San Luis Obispo and is a Wilderness First Responder. Please join me in welcoming aboard these new staff to our team!